Challenge of the Land: Open Space Preservation at the Local Level deals with the challenge of the land at the municipal level and how it can be addressed using proven techniques of open space preservation. Focusing primarily on the New York metropolitan region, this book describes actions that a municipal government can take to help control rampant urbanization and discusses the benefits of open space preservation. This book is comprised of eight chapters and opens with an overview of how municipal officials and civic leaders have had to come to grips with urbanization throughout the United States. The economic implications of population growth and the function of suburbia are considered. The next chapter outlines the benefits of open space preservation, including the establishment of recreational opportunity; the establishment of attractive community design and a visually pleasant landscape; and the maintenance of natural processes (that is, conservation). 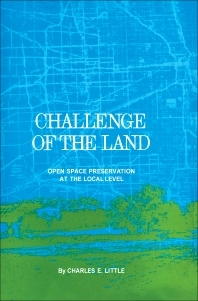 The following chapters explore the reconciliation of subdivision and open space; the use of basic acquisition techniques having to do with purchase, green space development, and the donation of land in fee or easement; and the approaches used by municipalities to preserve open space. The economic consequences of preserved open space are also considered, along with how the municipal government copes with the increasing forces of urbanization. This monograph will be a useful resource for everyone in or out of government, including county and municipal officials, as well as civic leaders concerned with the use of open spaces.